Alexie, S., & Forney, E. (2007). The absolutely true diary of a part-time Indian. New York: Little, Brown. 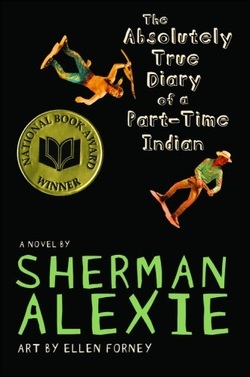 Semi-autobiographical, The Absolutely True Diary of a Part-Time Indian by Sherman Alexie (2007) is the story of Arnold Spirit Jr. (Junior)who is about to be a freshman in high school who decides to make some changes to his destiny. He lives on the Spokane Indian Reservation in Wellpinit, WA with loving parents and a brilliant sister who have not taken charge of their destinies as Junior is so desperate to do. In beginning of his first year in high school, Junior makes the fateful decision to switch schools to attend the all-white high school off the reservation. Their mascot is an Indian, which makes Junior the only other Indian in the school. Junior is not a "movie Indian." He's short, skinny, wears coke-bottle glasses and is prone to being beaten up by his classmates. His only friend is Rowdy, an Indian boy with an anger problem, and when Junior decides to leave for Reardan Hogh, it breaks Rowdy's heart. Of course, this means he breaks Junior's nose. And this begins the paradox of Junior's new life: by leaving the reservation, he is considered a traitor and tortured by his neighbors and old classmates but at the new high school, Junior is viewed with a bit of fear and even awe but struggles to fit in there too. This novel was a fun and quick paced read filled with illustrations designed to be viewed as the cartoons that Junior loves to draw. The writing and the illustrations are witty and self-deprecating, yet the reader can see the young man that Junior may yet become. I would recommend this book to any reader looking for a different (but the same!) outlook at high school life who enjoys a fast plot, realistic characters and great dialogue. The Absolutely True Diary is absolutely one of my favorite young adult books!